Jiri Tvaroh refers to himself as a universal photographer. His goal is to capture images of private events as well as commercial advertising. He attaches great importance to providing high quality pictures, taking into consideration the objective and requirements of the client. You may wish to view his portfolio. His career began when he was 17 years old, when he started taking photography more seriously and has been active as a freelance photographer more than 13 years. Jiri is focused on both commercial and private photography. He is an accomplished wedding photographer operating both nationally and internationally. Please refer to following links to view wedding pictures taken in Venice, Italy, Austria, and the Czech-Canadian wedding which took place in a vintage style setting. In cooperation with cameraman Petr Bastar he founded a 2VISIONS project for customers in the commercial sector. This project specializes in commercial photographic and video production. Please refer to following links to view a variety of references, ranging from lingerie shots with Miss of the Czech Republic to the musical video clip. One of the important projects that Jiri has become involved in is offering photography courses in Ceske Budejovice which he started in 2012. In 2014 Jiri has become the ambassador of FotoŠkoda centre, one of Europe's leading companies with photographic equipment. 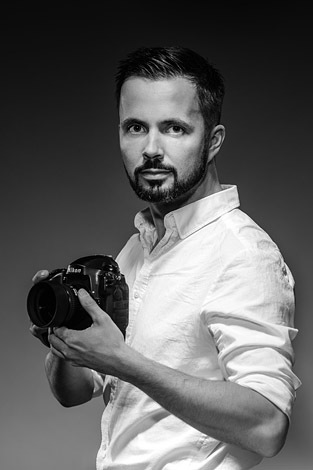 One year later, in 2015, he has progressed to trainer for the Nikon School, Czech Republic where he is specializing in the wedding photography.